At first an evergreen tree in the moon. Lu Ban  then made it, using all his skills. Outside it’s wrapped by countless pearly threads. As you can see it is described as a wooden staff devoid of any metal blades. So how did Sandy become associated with the Monk’s spade? It can be traced to a common motif appearing in late Ming Dynasty woodblock prints. 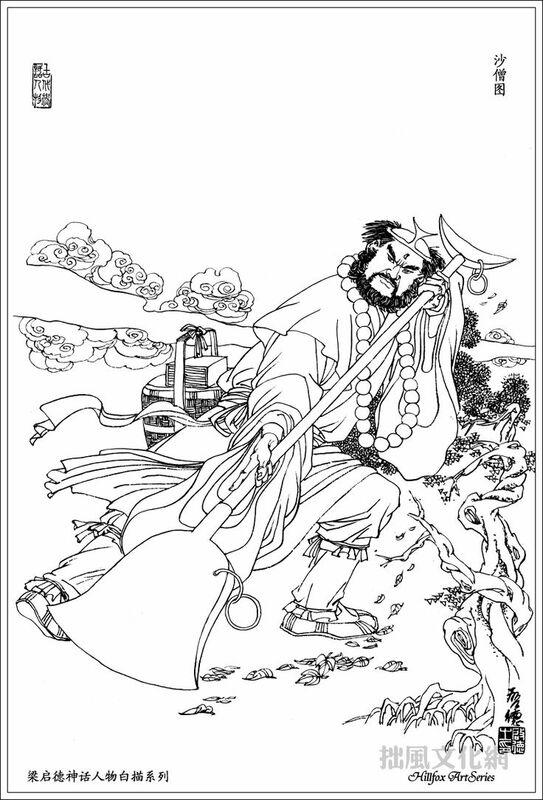 Sha Wujing is just one of a number of famous literary staff-wielding monks to be portrayed brandishing a polearm topped with a small crescent shape (fig. 2). 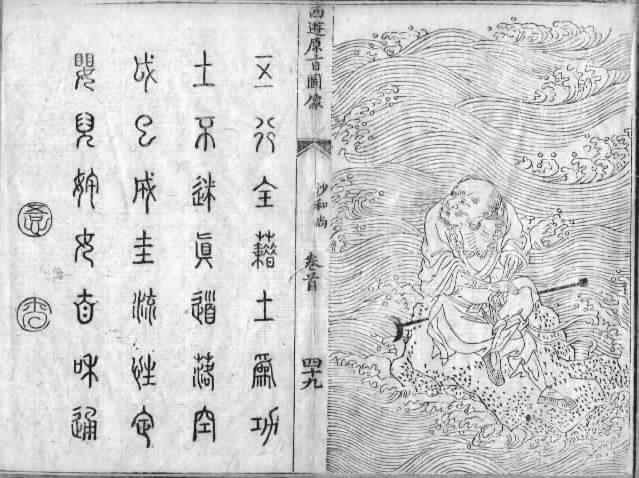 Others include Huiming (惠明) from the Story of the Western Wing (Xixiangji, 西廂記, c. 1300) (fig. 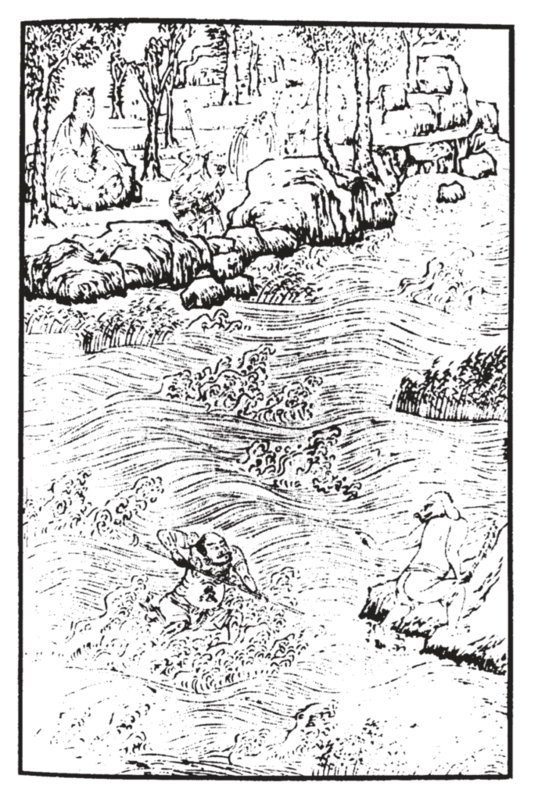 3) and Lu Zhishen (魯智深) from the Water Margin (Shuihu zhuan, 水滸傳, c. 1400) (fig. 4) (Shahar, 2008, p. 97). Fig. 1 – A modern depiction of Sandy wielding a Monk’s Spade (larger version). Fig. 2 – A late Ming Dynasty print of Sha Wujing with the crescent staff (larger version). Fig. 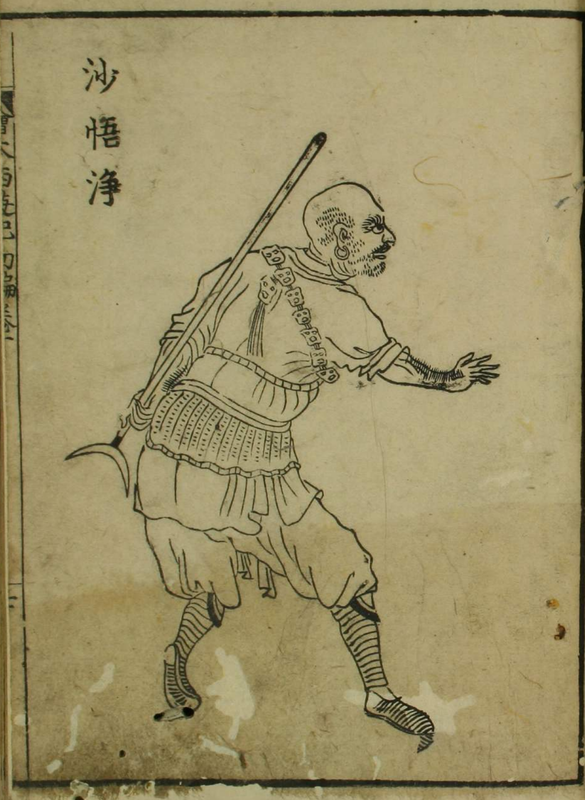 3 – A 1614 woodblock print of Monk Huiming with a crescent staff (larger version). Fig. 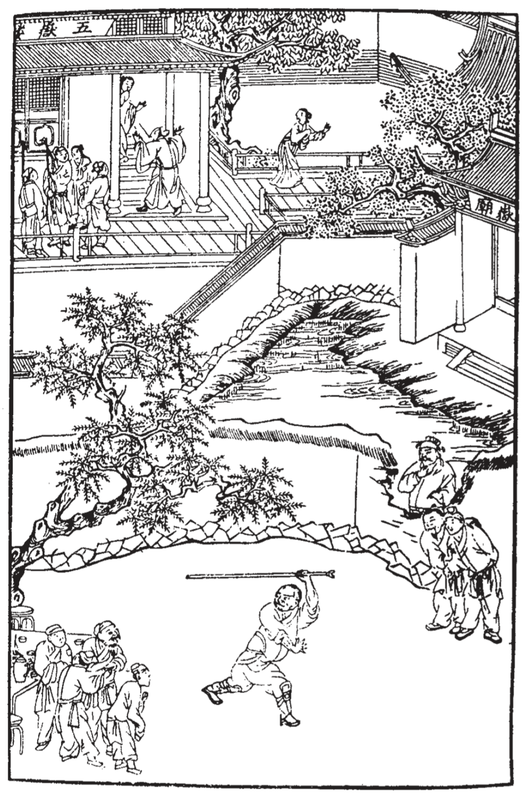 4 – A late Ming woodblock of Lu Zhishen with a crescent staff (larger version). Fig. 5 – Sha Wujing from Ehon Saiyuki (circa 1806) (larger version). Fig. 6 – Sha from Xiyou yuanzhi (1819) (larger version). Fig. 7 – A detail from a Long Corridor painting (circa 1890) (larger version). Future research may determine the origins of the crescent shape, which is visible in some Ming period illustrations of the staff. Here I will mention only that an identical design is common in a wide variety of twentieth-century martial arts weapons, whether or not they are wielded by Buddhist clerics. The crescent’s significance in contemporary weaponry can be gauged by its appearance in the names of such instruments as the “Crescent-Shaped (Yueya) [Monk’s] Spade,” “Crescent-Shaped Spear,” “Crescent-Shaped Battle-ax,” and “Crescent-Shaped Rake” (pp. 97-98). A woodblock print appearing in the first section of Journey to the West Illustrated (Ehon Saiyuki, 画本西遊記), published in 1806, depicts Sandy holding a staff with a large crescent blade (fig. 5), showing how the once small accent had been enlarged by this time to become a more prominent feature of the polearm. 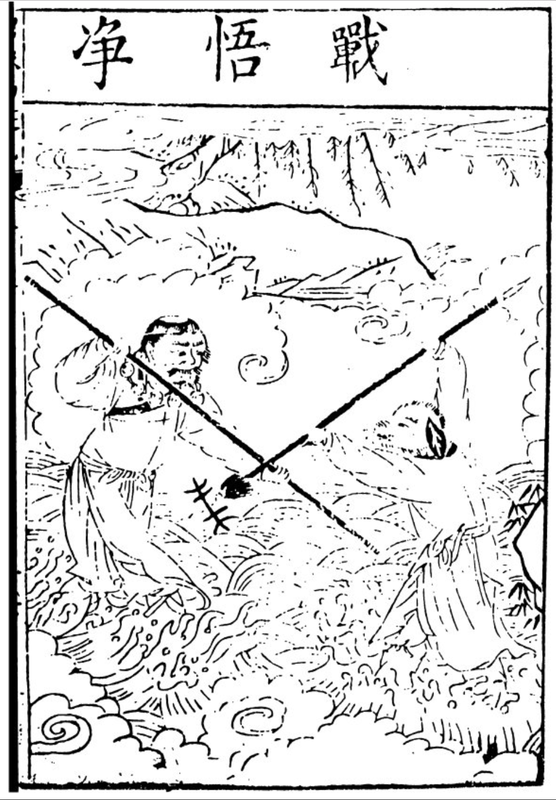 This same weapon is echoed in a print from The Original Intent of The Journey to the West (Xiyou yuanzhi, 西遊原旨, 1819) (fig. 6), as well as in multiple circa 1890 JTTW-related paintings from the Long Corridor of the Summer Palace in Beijing (fig. 7, for example). 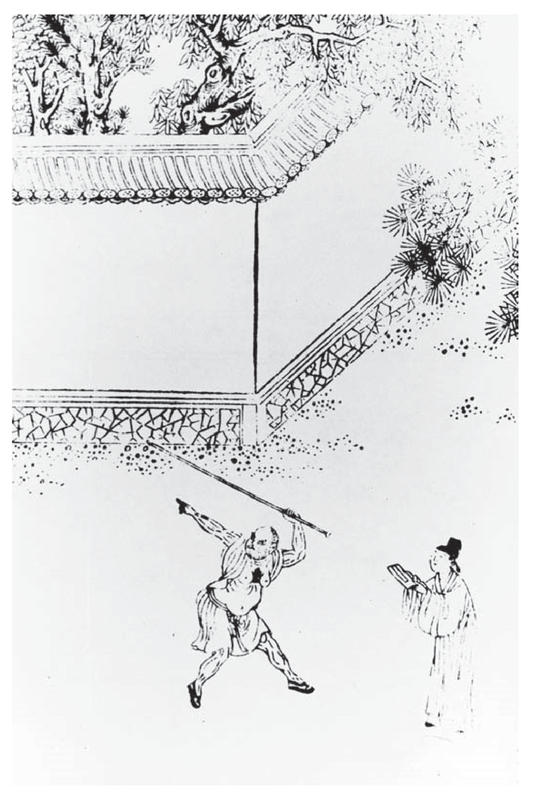 So Ming depictions of Sha Wujing wielding a crescent-tipped staff were most likely associated with the Monk’s Spade due to their physical similarities, and this probably took place no earlier than the early 20th-century. Enraged, Pilgrim shouted, “You brazen thievish fiend! What power do you have that you dare mouth such big words? Come up here and have a taste of your father’s rod!” Not in the least intimidated, the son-in-law parried the blow with his crescent-tooth spade; a marvelous battle thus broke out on top of that Scattered-Rock Mountain (Wu & Yu, 2012, Vol. 3, p. 183). There existed during the Ming Dynasty a military spade with a crescent blade on the top and a dagger-like blade on the bottom (武備志 (四十三) , n.d.) (fig. 8). This is most likely the weapon used by the insect demon. Notice the similarities with figures five to seven. It’s easy to see how the crescent-tipped staff from the Ming woodblock prints could have later been associated with this military weapon. The difference is one of degree and not kind. 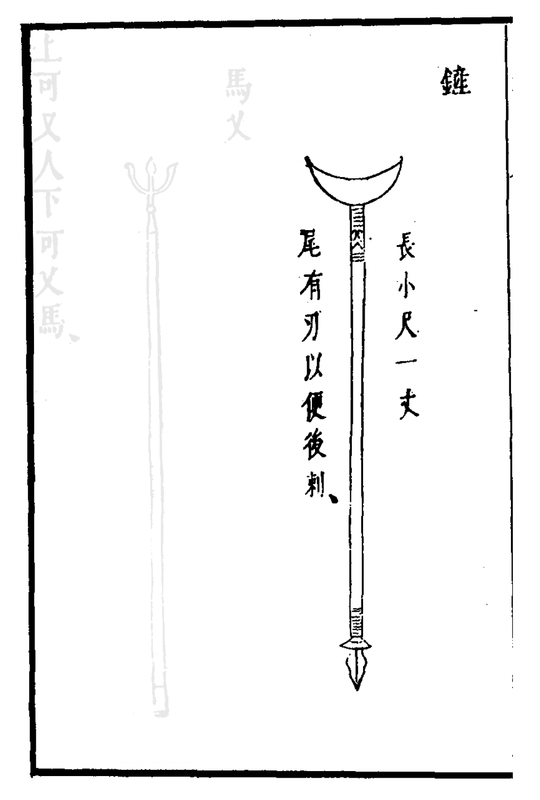 This polearm was later modified into the modern Monk’s Spade, leading to depictions of Sha Wujing wielding the weapon. Fig. 8 – A Crescent Moon Spade from the Collection of Military Works (Wubei zhi, 武備志, c. 1621), a Ming treatise on military armaments and fighting techniques (larger version). Feng Dajian of Nankai University was kind enough to direct me to this Ming-era woodblock print (fig. 9) by Shide tang (世德堂本), the original publisher of Journey to the West. Sandy’s staff is more evident in the piece. It even lacks the aforementioned crescent shape. Fig. 9 – Ming-era Shide tang print of Sandy vs Pigsy (larger version). 1) An Immortal of the Han Dynasty. 2) The god of builders. Wu, C., & Yu, A. C. (2012). The journey to the West (Vol. 1-4). Chicago, Illinois : University of Chicago Press.